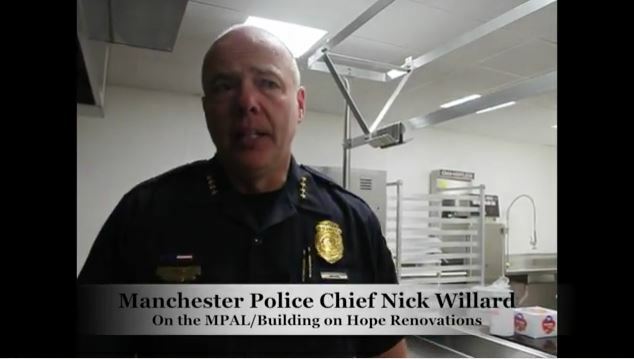 MANCHESTER, NH – Chief Nick Willard takes two minutes to talk about his initial reaction to the renovated Manchester Police Athletic League center, which was revealed to the public on May 22, and what the future plans are for the sprawling kid-focused community center. There is much potential in how Manchester Police will use the space, but the mission is very precise: MPAL is for the benefit of the kids, to give them a path to success in a world where there are many pitfalls, detours and cracks along the road of life, ready to swallow them whole. Says Willard, “Growing up a hardscrabble kid like I was, I would have needed exactly this, growing up.